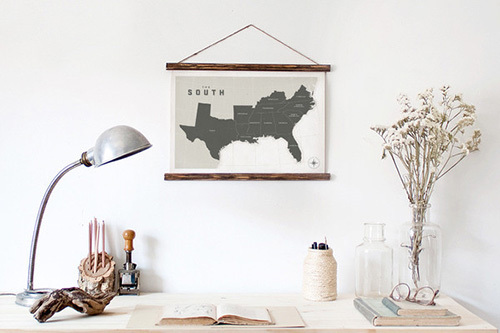 Brought to you from the guys behind one of my favorite southern sites, Bearings, this map combines "the stylistic qualities of both antique cartography and contemporary charcoal drawings." And at $40, it's a good deal. Each map is printed on thick 100 lbs. French blacktop paper and can be displayed as you desire. A second southern map option is available, against black. I'm a fan, hopefully someday soon i'll be a daily admirer too.